Model differences: see below under parts list. Optimal hydration ? mineralization ? deacidification ? for less than 5 cent per liter? 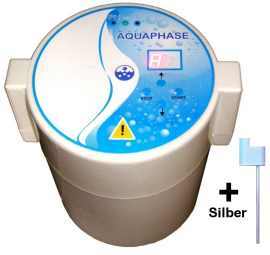 With a pH of 10 and an ORP of -850 mV the Aquaphaser has a a 10 to 100 times higher alkalinity than many normal flow-through ionizers (equals 1 to 2 pH points). Already 0.5 liters ionized water from the Aquaphaser® delivers the same amount of alkaline ions as five liters from conventional ionizers. For production of highly effective disinfection agents with pH 2.5 or less the ionization process can be extended at random and you can add some salt (natrium chloride). The Aquaphaser® can be filled with literally every water - be it normal or filtered tap water, cooked water, distilled Wasser or even bottled water. This makes you independent of the quality of your tap water. 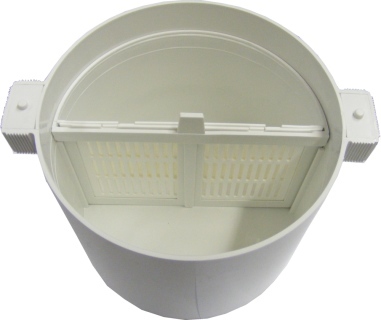 Works everywhere, no tap mounting, no tubes hazzle around the sink. Alkaline water has very small clusters. Lowest operation costs - replace expensive alkaline supplements, antioxidants (OPCs) by pure ionized water. No side effects, metastable phases, disintegrates back to normal water over time. High bio availability, is resorbed instantly by the body. Additional function for colloidal silver with 230 V pulsed DC voltage for CS in any concentration. Pulsed DC current is said to be better than continuous current, because no "ion channels" are created, through which - inspite of high purity of water - a locally higher current could flow, which would mean higher particle size. The quality of colloidal silver doesn't depend on the quality of the device, but on the purity of the used water: The purer the water, the higher its electrical resistance, the lower the current flow, the smaller the colloid particle size (tissue penetration power), the higher the used voltage can be. The Aquaphaser® with its 230 V suits the fast production of colloidal silver with (double)distilled water. The Aquaphaser® uses a 99,99% pure silver electrode. 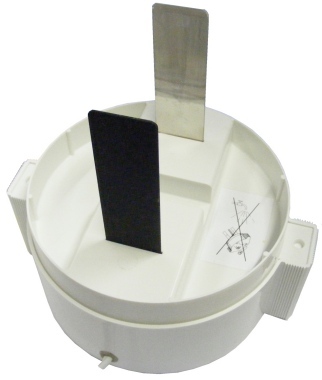 Aquaphaser-Multi device (pot, cap with durable titanium-ruthenium electrodes, D-shaped membrane with grid). At classic and multi device: Timer function with automatic shut down. The multi device: A silver electrode (99,99%). w-0038 Aquaphaser® replacement membranes 10 pcs.